Nonna Marijuana, a sassy expert on weed cuisine, cooks for those who medically benefit from marijuana-infused meals. Nonna is best known for her how-to videos on YouTube in which she teaches people how to infuse cannabis into their food. She has always had a passion for cooking, especially Italian dishes. Her daughter, who is an epileptic, relies on cannabis to relieve her from seizures. Nonna fully supports her choice of medication and has now dedicated herself to helping her and others who rely on marijuana for treatment. In this episode of Bong Appetit, a MUNCHIES show that focuses on cooking with weed, Nonna shares her expertise on cooking with the beloved cannabis. She considers marijuana to be “nature’s medical leaf” and the secret to living a long and healthy life. In the video, she prepares cannabis infused butter to compliment her favorite Italian dish called Chicken Cacciatore. While she does enjoy cooking with marijuana, she will not get high off her own supply. Nonna’s daughter Valerie and her husband founded WAMM, the Wo/Men’s Alliance for Medical Marijuana. This group provides hope and a means of relief for the community that requires treatment for various illnesses. In this episode, Valerie mentions that they have grown about 20 different strains of marijuana. The marijuana that they grow is organic and each strain helps in its own way. Valerie, who saw no relief from using pharmaceuticals, started this movement in order to push the legalization of marijuana in California. Not only did she fight for her own relief, she fought to help others get the same relief. 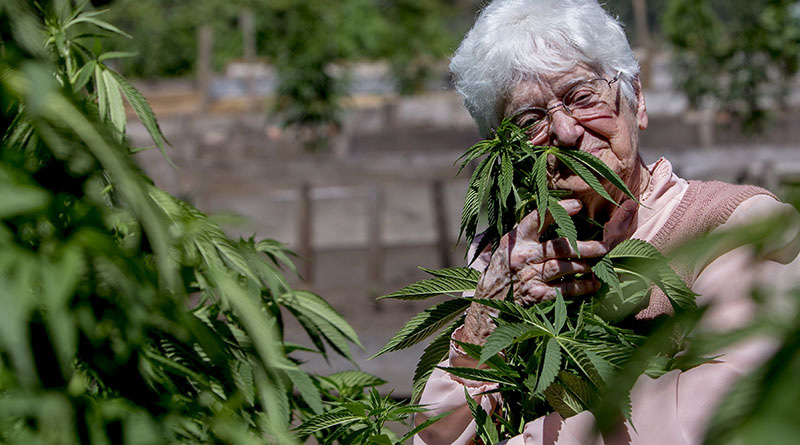 In order to help those who are in pain and suffer from any sort of illness, Nonna cooks using cannabis. Her and her husband continue to support Valerie and WAMM. Marijuana gives people the help they need without the side-effects of Big Pharma drugs. Nonna explains, in this funny and informative video, that marijuana controls her daughter’s seizures and that she would never advocate the use of pharmaceuticals. Nonna also explains that she’s a firm supporter of marijuana and that her daughter is living proof of it. Be sure to watch Nonna, the queen of weed cuisine, in Bong Appetit ! What did you think of Bong Appetit? Do you know of any good cannabis infused meals? Let us know on social media or in the comments section below.